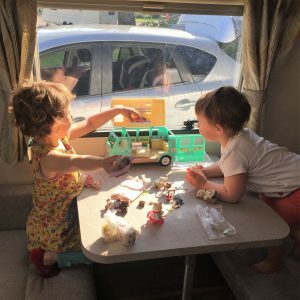 Toddlers and caravans, do they really mix? When we got our caravan the youngest was around 18 months old and she was obsessed with the buttons on the fridge. Her interest soon passed, but not before she’d defrosted the fridge/freezer a couple of times. We also spent a weekend trying to stop her throwing herself into a nettle bush next to our pitch. It didn’t end well, but she’s never been interested in nettles since. A few years on, the toddler phase has just about passed. What we’ve learnt is to pack wisely and get smart with the little mischief makers, it can make life so much easier. Our van has lovely pale grey upholstery. Perfect for showing up splashes of SpagBol and wayward felt-tips. To quell the anxiety levels I bought plenty of cosy throws to cover everything up. We have a load of toys that live in the van. The kids don’t seem to get bored of the caravan themed playthings and it’s a novelty every time they come out. We also have foam mats for making playing in the awning more comfortable. I’ve got a crafting cupboard stuffed full of colouring books, crayons and activities. When it’s raining all this stuff is invaluable. I also learnt the hard way that glue and glitter is not a good idea, not even in the awning, disaster. I always ask for a pitch near the play park and, wherever possible, away from the main thoroughfare. **NB. A murmur of disapproval from the hubby. Not too close to the play park apparently, the caravan may get damaged by passing kids. The photo at the top speaks for itselfâ€¦ Our kids are out the van door and knee deep in mud within about 30 seconds. Pack loads of spare clothes and adopt a healthy attitude to bugs, slugs and mud. Sleeping arrangements can be tricky in the caravan. Who sleeps where and how to keep everyone safe (and in their beds) can cause frustrations. Having a sidebar for the lower bunk bed worked a treat and we could all relax knowing nobody would go bump in the night . Keep them to hand and grab when necessary. We get through loads of wipes for the inevitable spills and sticky hands. ‘Hangry’ kids are a nightmare. Have snacks ‘ready to go’ and close to hand. And I try to have a mixture, treats and healthier options too. This is an all-round favourite. We use ours for keeping the shoes tidy, then we tip everything out and fill it with water and bubbles at bath time. The kids love it. This is seriously helpful. I use it to double check we have packed everything we need. Usually, there’s something I’ve forgotten or it acts as a reminder that something needs replacing. Our Curious Campers packing list can be found here. 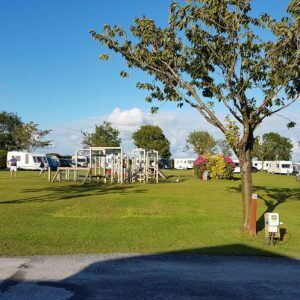 We hope to champion caravanning and shine a spotlight on beautiful and unusual places that we find fascinating and fun, sharing tips we’ve discovered along the way.